electro-music.com :: View topic - 281 clone project- taking orders now for last run of these..
281 clone project- taking orders now for last run of these..
interested in a PCB or 4? no skype but u can pm? what board is your peak circuit on? 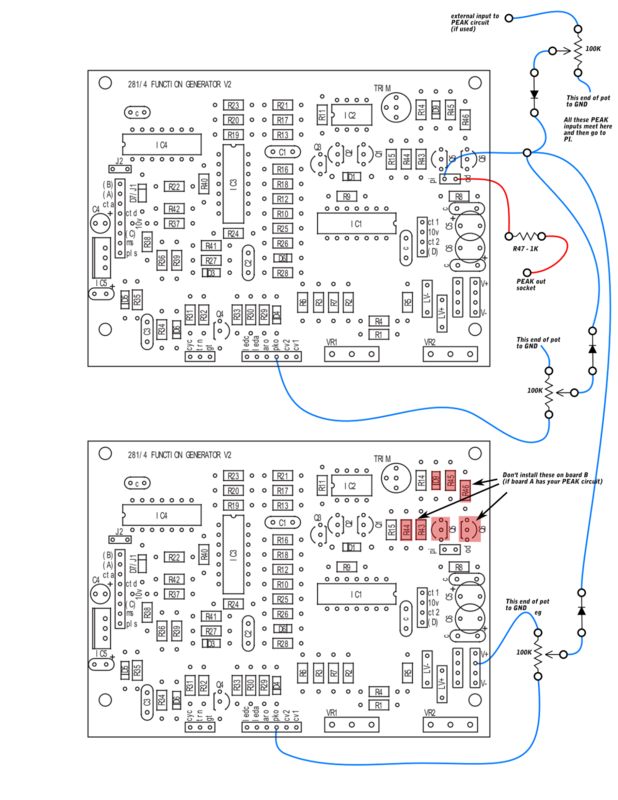 edit: your diagram looks wrong for one reason, I should have noticed this earlier... the PEAK circuitry is only built on one board - think of it as a separate sub-circuit - so the PEAK IN socket should go to the same PI pad as A PKO and B PKO, the output of this sub-circuit is PO. I think a diagram would definitely be of use here, as you can clearly see from my efforts! This could well be the problem then! I never noticed this in the build docs! I have them both working now (sort of).. The B Level pot I have wired (similar to my diagram - or the bottom most pot of your diagram) does nothing? I'll try to get a pic of the front panel, but the whole thing is a mess until I can get it all bolted back together, once it's working. The three pots (from top to bottom) are amount of external signal in to the PEAKcircuit (not on your panel, so ignore the pot and just go PEAK IN thru a 1N4148, amount of A to PEAK circuit, Amount of B. If you don't have pots ignore them, as it says on the blog. V2 vs V3 - they look the same to me in this area apart from R47 being on the V3 board, if you compare them you would see that. So do both boards cycle if left in cycle mode? or do you mean they just stop after a while? Mine stops unless triggered once, which I thought was a feature? all seems to be sorted now, have it syncing some oscillators in a crazy fashion. Good news! To be honest I wasn't sure mine were working at first! Is one 10v voltage regulator and one cap C4 enough for four boards? I'm using an LM7810C for the regulator. 2) it will anyway reach maximum (10 volts or so) and then will fall down to zero? The first case seems more convenient for me reminding an ordinary "ad\ar\asr" generators, but I have a suspicion that it's second stated above case (i'm just experimented with my own designs using discrete integrator and ota on the 281 cmos). Ok I am at the end of my nerve people, Its been an awful week of DIY and I just finished building my 2nd 281. Unfortunately it has exactly the same problem that my first one did (and still does) so now I have two dual 281's that don't work. But both of these other problems were fixed by either replacing the 5240 diode or switching the pins on the mpf102. I have replaced these parts several times now, and still have the same problem. I have checked all the Cmos chips are getting 10v and the other IC's are getting the appropriate power. I also have tried a bunch of different IC's and have swapped the cd4016 with a cd4066. Same deal, the outputs of the cd4066 DO seem to be passing the voltage changes from the attack and decay knobs, maybe the lm13700 is not functioning properly? I have tried swapping them out also. Please, any advice on getting these 281's to work would make my day! The weird thing is if I put 12,80V to the module its cycling and working correct. What shoud I do raising R7 & R8 ? PS: it's not my power supply is strong enough (3,3A) and I tested it with just the 281 connected. The trigger pulse should be 10V. I had trouble triggering cycle mode at first but found out my trigger pulse peak voltage was too low. Nobody with a suggestions for my problem ? Or maybe somebody has the same problem ? they have nothing to do with it, OK so are you saying, when powerng the unit from +/-15V, you cannot trigger the envelopes at all? or- that ASR and AR mode work fine, but no cycling? 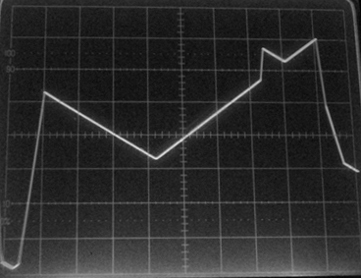 Gonna test the ASR and AR on 15V tonight but indeed there is no cycling when a trig is given in lfo mode. 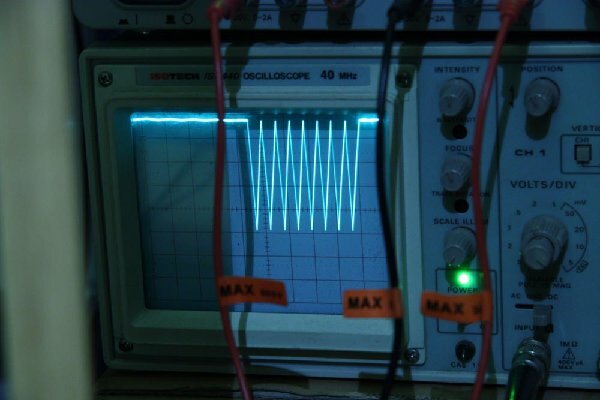 If i power it with 12,80V the lfo mode work as it should...And cycles when a trig is given. I have built four V3 PCBs and have some problems. I can't get none of them to cycle, when in cycle mode, they will cycle twice then stop. Also this one is really strange. After about 5 minutes one of the A-boards will hang in quadrature mode and just give a continuous gate, it happens every time. It release the gate when I flip the quadrature switch, but will hang again if I turn on the quadrature. The other tho 281s that are linked will both hang in quadrature mode. If I power off and then on again directly the modules will do the same thing. If I leave the power off for a while it's all good again for another 5 minutes. Also the end pulses just work sometimes on some of the modules. I really can't figure these problems out!? To those with having cycle problems, my dual has been working great until I switched to a different power supply recently. 'A' would cycle fine, but 'B' would not. I always noticed that my 'B' was sort of "softer" and needed a stronger gate to get going in in the first place, but nothing would get it to cycle with the new PSU. I checked it out on my bench supply and my 'B' would indeed cycle. I had noticed my new PSU was running going a little hot, measuring 15.65V +/ when I installed it, but figured it would be fine. So I cracked it open just now and trimmed it down to the appropriate levels, and lo and behold, 'B' is back to cycling. Perhaps with too hot a power supply it is expecting a proportionally larger gate than 10V and with the circuit even the smallest deviation in the supply makes a difference? Just a heads up for those having troubles that it might be worth checking your supply voltages thoroughly. My PSU is exactly +/-15V, but still these strange problems on all four of my 281 V3. End pulse will just work sometimes on some of the 281s, but then only when ASR is selected, AR doesn't give any end pulse. Quadrature works sometimes but usually just gives a continuous gate to both 281s. Cycle mode doesn't work properly either, most of the time it cycles twice then stop. I took the module apart and checked with just one 281pcb because I tought It had something to do with using one voltage regulator for 4 pcb's but I have the same problem with just one pcb ?? It stops cycling when I go above 14V on the positve rail ? I have the same problem with the 4 pcb's ? Sombody can help me out plz ? I tryed to read the schematics I guess it has something to do with the CA3080 IC ?